Form Fitting, this Tanktop Tee starts out soft, and gets softer and more comfortable with each washing. The Rib makes it very comfortable as it forms to your shape. Versatile great staple for everyday wear. The style will conform to your shape, and this Tank Top also Runs SMALL, so please check the chart for the actual garment measurement. Sizes are a modest S, M, L, XL. Sized on the small side, so if you may want to order UP a size or even two sizes. Check our Sizing Chart for ACTUAL pre-wash measurements. Because they are 100% cotton, you can expect a small amount of shrinkage, so please allow for this in choosing your size. 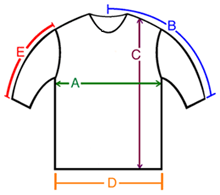 A: Chest / Bust circumference " 22" 26" 30"
B: Sleeve length from center of neck to end of sleeve " 13" 13" 16"
C: Body length from shoulder to bottom of hem " 22" 23" 27"
D: Hem circumference " 12" 12" 15"
E: Sleeve length from shoulder to end of sleeve "